Look at me! Look what I did! Here's an iPhone snapshot of my little corner at "Nuts, Bolts and Slabs of Steel," a gallery show devoted to all things bridge-related. It continues through September in the lobby of the Olympic Mills Conference center down at 107 SE Washington St. If you go, please, be gentle. This is my first time (at having any of my photos displayed on a wall in a public venue that isn't right next to my high school's dark room in the year 1997). 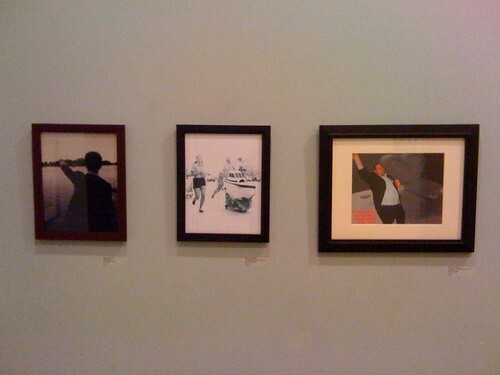 My three photos are tucked over by the bathrooms. Also: here's a photo someone took of a gal ignoring my photos at the grand opening back in July. It should go without saying that this image currently serves as the background on my laptop.